The Heritage Lottery Fund is putting £2.7m into restoring a historic mining area in the South West. For the first time people will have access to privately-owned areas of the Tamar Valley in Devon and Cornwall with 60km of new trails and cycle paths. The area was once the site of the Devon Great Consols, the biggest arsenic mine in the world. 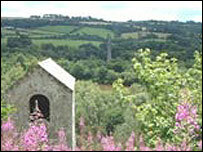 It has received grants from a number of sources since being designated an Area of Outstanding Natural Beauty in 2000. A canal will be restored to allow it to be used by small boats and canoeists and the first permanent footbridge across the River Tamar since the 15th Century will be built. Past projects include a £1m facelift for Morwellham Quay, which has seen a dramatic fall in its visitor numbers in the last 10 years. Unesco is also considering a bid for World Heritage Site status for the area, based on the global influence of Cornish mining. If the bid is successful it will put the county on a par with Hadrian's Wall and Stonehenge and should encourage thousands of extra visitors.